﻿Our membership drive is one of our most important fundraisers - through membership dues, the PTA can raise funds to donate needed items back to the school to benefit our students. Please help out our school by joining the Legend Springs PTA Today! If you haven't joined the PTA yet, please join! During the 2017-2018 School year, Legend Springs families brought in over 30,000 Box Top$ which is $3,000 that goes back to our students and classrooms! Thank you all for such an amazing year! 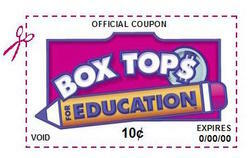 Collect and send in Box Top$ for Education with your child to their teacher and/or school office so that Legend Springs can receive $0.10 for every Box Top! Please make sure your Box Top$ have not expired, otherwise they will not be accepted. Each class has the chance to earn TWO Ice Cream Sandwich parties for the 2018-2019 school year! All you have to do is bring in 1200 Box Top$ (as a class) between the beginning of the school year and November 30th and another 1200 between December 1st and April 27th! Ice Cream Sandwich parties will be held in December and May. PLUS, all students that turn in Box Top$ earn a chance for treats and goodies during random drawings throughout the year! Click here to shop at Amazon Smile and a percentage goes to Legend Springs! Be sure to click this link every time you shop at Amazon. The shopping experience through Amazon.com is exactly the same as it would be if you went to Amazon directly, but if you access Amazon by clicking on the Amazon button on our website, we get a percentage of your purchase. Share with friends & family - anyone can help earn for Legend Springs! "The Tyson Project A+ is one of the simplest ways to support your school. Just clip and collect Tyson Project A+ labels from Tyson packages. For every label you submit, we'll give your school 24 cents, and you school can use the money for whatever it needs". Click here if you'd like to visit the website. ​Earn cash for Legend Springs when you shop at Fry's. Click here to get started. Did you know last year we earned $1700 from Fry's? We only had 43 families participating last year. Let's try to beat last year's enrollment. You must link your card at the beginning of each school year. See the below website for easy linking. The school ID is 81716.